While aggressive marketing from dairy industry tries to convince the children and adults that milk is very healthy and that it should be drank as much as possible, the truth is quite opposite. Every mammal has a different milk composition and its purpose is to raise the cubs of their own kind. Cow's milk is not the only nor the appropriate source of calcium. 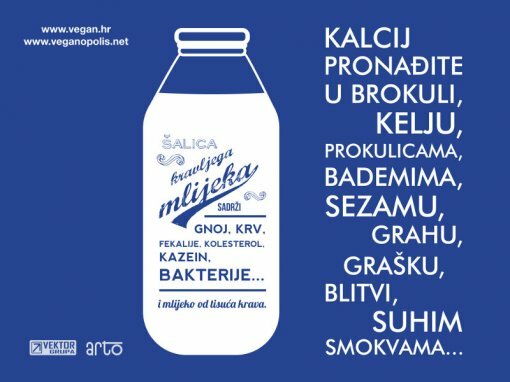 Therefore, Animal Friends Croatia is via billboards trying to point out the truth about the milk that is so deeply hidden despite common sense and it is rare that anyone dares to pronounce or write it. Doctors and other food experts are pointing out to this truth for decades. The famous "China Study" by Ph. D. T. Colin Campbell makes a series of studies showing that consuming dairy products may increase the risk of prostate cancer; Europe and North America where the most calcium from milk is consumed recorded the highest rates of colorectal cancer; it's well-documented that protein ability from cow’s milk initiates Type 1 diabetes and that the countries that consume the most milk and dairy products also have the highest rates of fractures and the least healthy bones. Experts from the Physicians Committee for Responsible Medicine (PCRM) indicate that the 12-year Harvard study which involved 78.000 women showed that women who drank milk three times a day had more frequent bone fractures than those who drank it rarely. The study of elderly people in Sydney (Australia) in 1994 concluded that increased consumption of dairy products was associated with an increased risk of fractures. Calcium is important for bone protection but it is also important to keep it within the bones. While the dairy products absorb 32% of calcium, from cabbage, broccoli and sprouts is absorbed 50-60%. Vegetal foods rich with calcium contain nutrients that are important to fight cancer. Cow's milk is clearly intended for calves, not for human consumption as the human milk is for human children, so it is not surprising that it creates so many health problems. For human body, Casein from milk is difficult to digest and other milk by-products leave inside the body a lot of toxic substances that are very acidic. Milk has an unsuitable mixture of calcium and phosphorus and it washes calcium away from the bones which can lead to osteoporosis. Milk and dairy products consumption causes many diseases associated with intense and relentless cow breeding by dairy industry. Most dairy products that we buy contain allergens, fat, cholesterol, herbicides, pesticides, dioxins, antibiotics, blood and puss as a result of inflammation of cow’s udder, bacteria and viruses. Cow's milk really is "the most perfect natural food", but for calves. Man is the only species that drinks milk from another species and the only ones to consume milk in adulthood. Therefore, it’s important to teach children from an early age that all they need for healthy bones it’s a lot of movement, sun and calcium but not from milk. Schools should encourage children to eat more vegetables from which they will receive not only calcium but also other useful substances important for healthy growth and development. Children also deserve an information that healthier source of calcium comes from green leafy vegetables, tofu, legumes, dried fruits, seeds, soy products and beverages fortified with calcium. For more information also visit www.veganopolis.net.